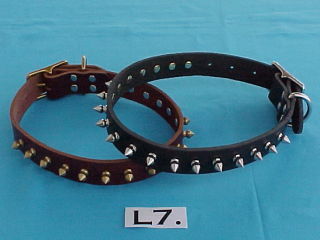 The Whole Point Of Having A Spike Collar Is, That It Is Sharp! L5. 1/2" Wide Spike Collar. 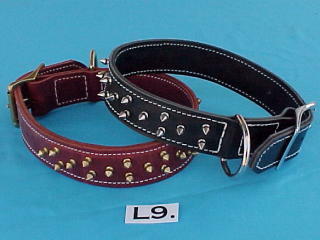 Or Burgundy Latigo Leather With Brass Spikes & Buckle. The Spikes Are 1/2" Tall, Spaced 3/4" Apart. L6. 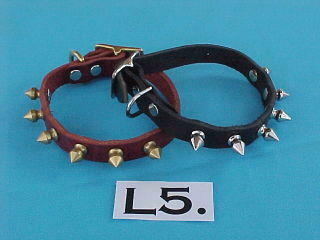 3/4" Wide Spike Leather Collar. L7. 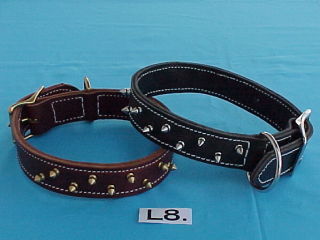 1" Wide Spike Leather Collar. The Spikes Are 1/2" Tall, Spaced Alternating 2 Wide & 1 Wide, 3/4" Apart. 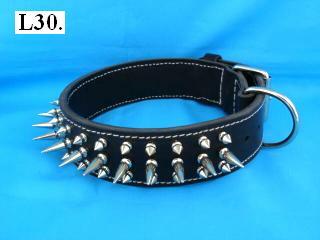 Made Of Black Latigo Leather With Silver Spikes & Buckle. 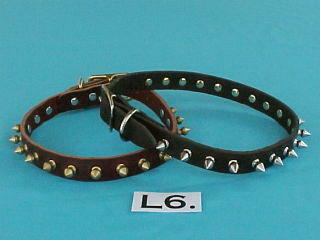 Has a steel D ring in front of the buckle, so the dog pulls against the whole collar. The center row of spikes are 1 1/4" tall, the 2 side rows are 1/2" tall.